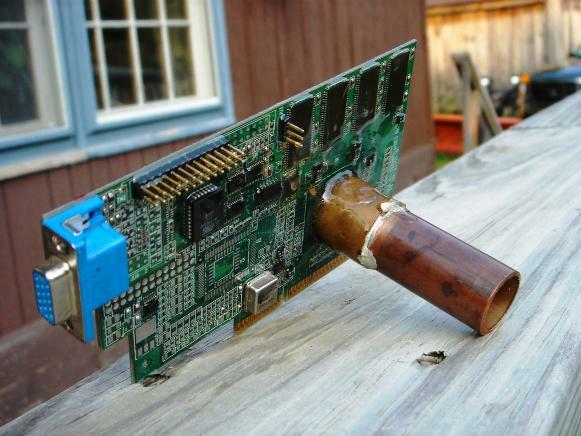 Nice card, is it loud under full-load? Thanks, you notice a tiny amount of noise under full-load with auto fan speed at 50% (1920 RPM). Manually set to 70% fan speed (2640 RPM) for benching the fan isn't unpleasant but set it to 90% fan speed (3330 RPM) and you can hear it outside the room. 100% fan speed= 3570 RPM, idle is normally 30% on auto fan speed (1110 RPM). The case is just 2 feet away on my huge desk. I don't have any very recent Nvidia cards to compare it against but it's probably the next best thing to the piece and quiet of H20. The triple fans on these GPUs is amazing. When I first installed it and was working in Photoshop I kept checking the fans to see if they were moving and I couldn't hear them at idle. Found a review for the 4GB Ultra Charged with auto-fan and same cooler at stock - idle: 27dB / load: 33dB - LINK. I'm jw, did you think I or anyone else used a tripod? I found this of my first GPU and I had to show it. Yip, I know I had the CF bridge on both fingers but I was worried about losing it and left it on. Today is my nostalgic GPUs day, so I bring you more pictures, this time it's an old AGP ATI 9600 Pro/XT. Enjoy! Yeah, the card still works! Today is the day, the wait is over, finally! I'm doing a fresh Windows install right now on the main rig, and then will test the card. Did yours also arrive with soft foam too? And what made you decide to fit an aftermarket cooler over the pretty decent one provided? The Twin Frozr IV cooler makes too much noise when fan is above 55-60%, but I didn't yet have installed the AC Xtreme III. The card's overclock margin and method to do are ridiculous, with the latest MSI AF or EVGA Precision-X, I can't overvoltage, so even with +20 oc on clock, the card chash. Only with MSI AF 2.2.3 I can OC a bit further, 1267-1280(boost) with +60Voltage, but although the card seems not very stable at Unigine Heaven. The Vram are not Hynix or Samsung, but Elpida, which are known for less overclock potential, however I'm able to push them to 6600 MHz, not 7000MHz that most of people can do with Hynix or Samsung chips. The other negative aspect that I mentioned earlier, is the sticker on the screw that when removed avoids the warranty, but I have to remove it to install AC Xtreme III. I even unlocked the bios with Kerpler Bios Tweaker, to push the Power Limit above 14% to 125%, and voltage from 1.50v to 1.21v, but didn't help nothing with OC stability. To sum up: The performance in games like BF 3 or COH 2 is 60 fps locked, which is great, but the OC potential, noisy at benchmarking and some "heavy games" and the warranty policy, let me a bit sad of the purchase, mainly because I waited so long to upgrade my card, and now I feel a bit disappointed. Excellent summary/testing of the MSI GTX670 in such a short time Sorry to hear that it wasn't up to your exceptions. I know that normally you can remove the stock cooler and use your own aftermarket solution without issue cos I've done this to a couple old GPUs. For RMAs, place the cooler with the thermal pads in the correct location in a sandwich bag, making bag as airtight as possible to avoid drying out, that way if you return it. They should be non the wiser but the sticker is a bugger. And what was the difference in overall temps stock/aftermarket from your testing? I never understood this 7GHz memory overclocking competition. My both cards run at 6208 and I wouldn't go any higher. I already burned two cards with high memory clocks and the last thing you want to see on the screen are bright dots and artifacts. I do believe you that Twin Frozr 4 is loud, I never imagined that DirectCU II would be so much louder than WindForce 3X. Usually cards with larger fans are quieter, my Galaxy has bigger fans that ASUS. You can clearly hear the difference. Hopefully your Arctic cooler will be much better. What is to understand? That is all they did with the "new" GTX 770 is clock the VRAM to its potential, I have been pushing clocks on cards since the NV 6800 and with adequate cooling I have never burned up a single card (that is with using soldering irons to put potentiometers on them), My GTX 660 Ti has been running at 7020 MHz for 9 months now with not a single issue (card never breaks 73C, even with SLI). ~1998: I first got the old PC of my father. 60/75MHz (turbo) and no dedicated GPU. Short after my brother bought a new PC and I got his 100MHz Pentium machine. No GPU, but 16Mb RAM! (or was it 8? not sure...) The games I played that time are Warcraft 1 + 2, Diablo, GTA, Doom, Quake, Blood and many more. 2002: The first PC of my own! Including the famous Nvidia MX440. It could run games like HL, CS, SeriousSam 1st + 2nd Encounter, GhostRecon(1), NFS (3? I think), MaxPayne 2, Earth2150, Morrowind, GTA3 and some others. 2012: I built my current rig with the GTX660TiOC from Gigabyte. I think it cost something between 200€ and 250€. The only games that reveal the limits of that card are Crysis3 and Skyrim with mods. I have not tried AC4 or BF4, though. Wow that's quite a history here. Judging from those photos, you are probably eagerly waiting for new gpus, aren't you? 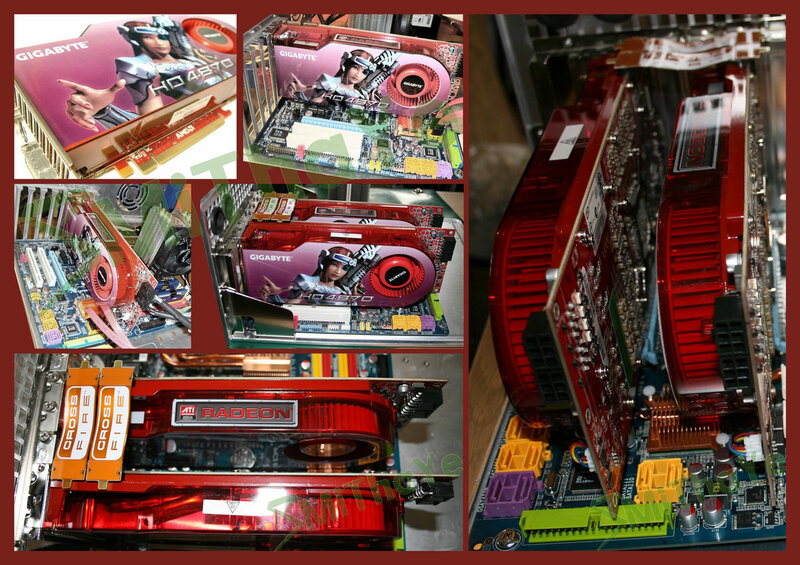 Yeah wow, that's an impressive history of GPUs, thanks for the photos Btw some are listed as just Nvidia such as 8800 GTS and my 8800 GTS 320MB was BFG back when they were kicking OC hell out the competition and ELSA which I also had fond memories of. Crazy there were 320/512/640MB variants released over the months lol. I do wonder why you bought the lower SKU and later bought slightly faster cards on various examples (ie 4850 > 4870 > 4870x2), interested to know why you decided this and if you kept them? What recent GPUs do you have now, anything more recent than 2013's Hawaii, if not why did you stop upgrading? You have a healthy selection of cards from a variety of manufacturers, which cards were you most fond of and do you have a bias towards certain manufacturers? Were any of these cards eventually modded, blocked, or used aftermarking cooling? 1. At the time, I had enough funding for the high end. Voodoo was bought by my parents, not me, it was so exceptional. 3.For video cards, I take what I have of cheaper, I do not have specific brands. I usually only takes the high ranges, others are obtained by chance by my contacts. I even imported it from the us to europe. That was around 1997. Nice, do you have any pics? I remember Voodoo era quite well, but I never had the opportunity to use any of those cards. Most DOS games were running just fine without any accelerator. The first game ever to give me a low framerate was Destruction Derby 2.